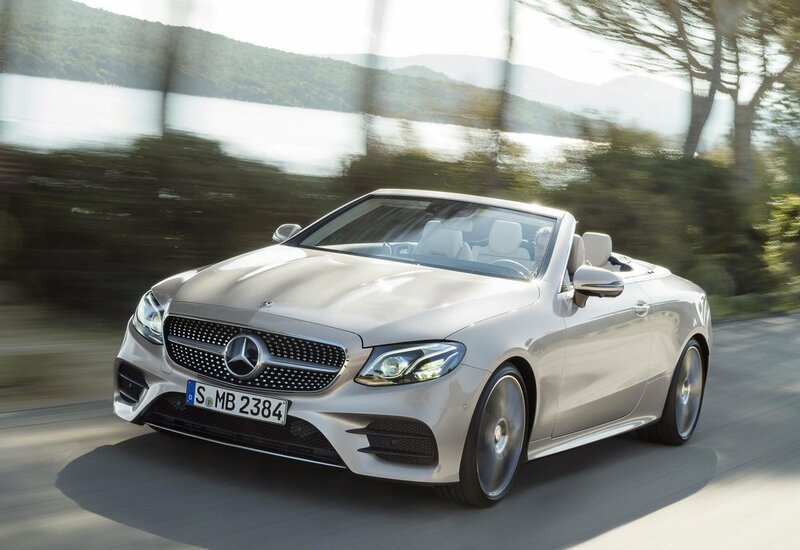 A Cabriolet model has become the fifth and newest member of the Mercedes E-Class family. The four-seater features a classic fabric soft top, with what the German brand describes as ‘unbeatable comfort’ for four occupants. The latest technology are also present, including smartphone integration with a wireless charging and key function, a widescreen cockpit and the latest assistance systems. From market launch, there will be initially a choice of ‘powerful and efficient’ petrol and diesel engines - including versions with 4MATIC permanent all-wheel drive for the first time. Further engines will be added to the line-up in due course. As standard, all models are equipped with the 9G-TRONIC nine-speed automatic transmission, which allows fast gearshifts and lower engine speeds. The suspension is designed to offer ‘agile driving pleasure’ as well as a comfortable ride. Comfort-tuned DIRECT CONTROL suspension with an amplitude-dependent damping system, which is 15 millimetres lower than the Saloon’s suspension, is fitted as standard. The likewise lowered DYNAMIC BODY CONTROL suspension with adjustable damping is available as an optional extra. With this suspension, the driver can modify the vehicle’s damping characteristics using the switch for the DYNAMIC SELECT system - from a “Comfort” setting to “Sport” and “Sport+” modes. As an option, the Cabriolet can be equipped with the AIRCAP electric draught-stop system and the AIRSCARF neck-level heating system (exact UK specification to be confirmed). 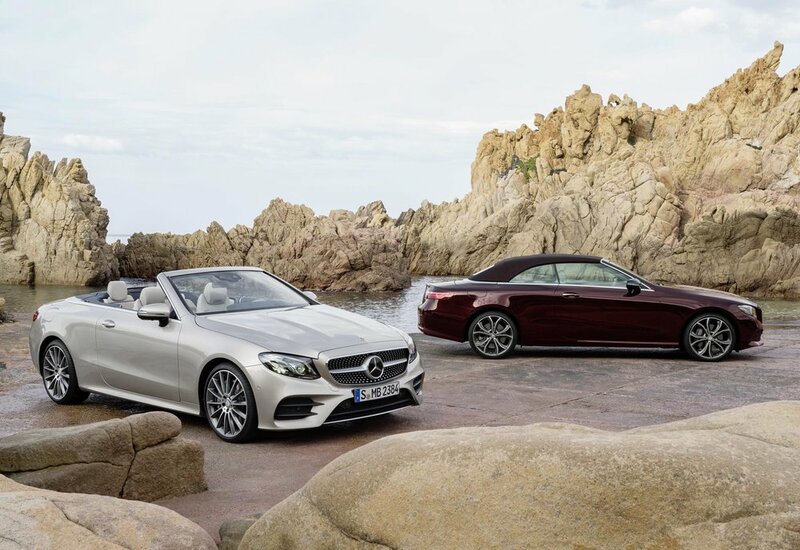 When the soft top is up, the E-Class Cabriolet has a silhouette similar to that of the E-Class Coupé. The close ties between the two models are apparent in their shared design language, with the emphasis on surfaces with clean lines. The soft top can be fully opened and closed in 20 seconds when travelling at a speed of up to 31 mph. After opening, it folds down in to a soft-top compartment in the boot. A retractable cover separates the soft top from the remaining boot space. The boot capacity of 385 litres (310 litres when the roof is open) means the E-Class Cabriolet doesn’t compromise on practicality. The all-new 50:50 folding rear seat backrests create a through-loading feature in the interior. The front section has a low-positioned diamond radiator grille and centrally located star, LED High Performance headlamps (or optional high-resolution MULTIBEAM LED headlamps), a drawn-out bonnet with ‘powerdomes’ and fully retractable side windows underline the dynamic looks of the Cabriolet. The tail lights resemble the glow given off by a jet engine, says Mercedes and as a new feature, the tail lights also put on a special show for the driver when they approach or leave the car. 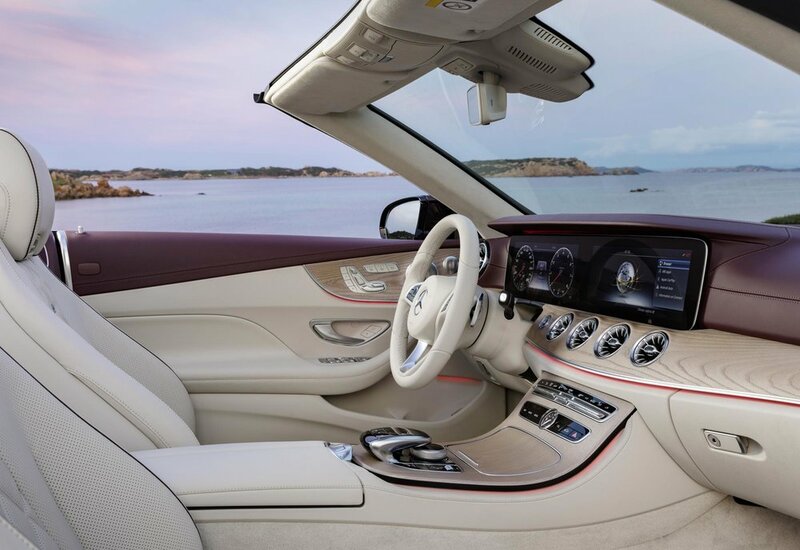 A visual entity comprising anodised, polished aluminium (AMG Line in matt aluminium) is created by the trim frame on the A-pillar and front windscreen along with the shoulderline trim strip and a wide trim finish that surrounds the soft-top compartment. The third brake light is integrated into this frame. Suspension that is 15 millimetres lower than that of the Saloon emphasises the sporty character of the E-Class Cabriolet. The car thus demonstrates its sporty credentials even with the standard 17-inch tyres (19-inch in the UK).